Researching Pearls at the Milwaukee Museum, from left Norm Lange, George Johnson & Eve Alfillé. Wisconsin Pearl Rush historian and journalist George Johnson will be returning to The Pearl Society with friend and fellow pearl aficionado Norman Lange, (also a past Pearl Society speaker) will moderate a lively lecture and discussion titled “Wisconsin Pearl Stories”. Lange is long-time pearl dealer of natural American freshwater & oriental pearls, among others. Johnson will be signing copies of the Spring 2012 edition of Wisconsin Magazine of History issue featuring “Wisconsin’s Pearl Craze.” The first 40 attendees will receive a free copy of this issue! As many of you know, Natural American pearls were extremely high valued in the nineteenth century, especially in the Art Nouveau era when the asymmetrical forms of nature were favored. Most of the Jewels from that era in European museums are set with beautiful American natureal pears, as opposed to the round oriental pearls. Of course, once the rush took place, the pearl-bearing mussels took a long time to recover, and pearls now are very few and far between, especially in the face of on going pollution. When word got around that there were pearls to be found in the Mississippi and its tributaries, there was a big rush, similar to the Gold Rush, which until recently was not documented. Johnson spoke to our membership about the American Pearl Rush in March of 2011; and has recently published his article “Wisconsin’s Pearl Craze” on the subject in the Spring 2012 edition of Wisconsin Magazine of History. This meeting of the Pearl Society is a continuation of last year’s discussion of the Pearl Rush, including stories of individual pearls. Together with Norm Lange, Johnson will go into some detail about identification and collecting of our natural pearls. Are my Pearls authentic? How do I tell? I was recently given a four strand gold pearl necklace purchased in the Philippine Islands in the 60’s. I am questioning their authenticity. You have asked a great question, are they in fact pearls from an oyster, or man-made? 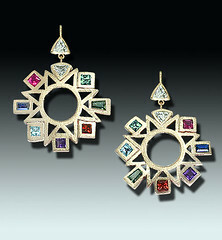 This comes up quite often as people inherit jewelry from family members. And, in fact it is fairly easy to know. The Pearl Test: The simple test is to rub them one pearl against another (you can rub fairly hard). Pearls cultured from oysters are gritty in feel even thought they may look smooth. Natural or cultured pearls will have that gritty feel when you rub them together, while faux pearls feel smooth. You can also rub a pearl against your teeth, if you like, and your real pearls will give the same impression of grittiness. This is due to the fact that the organic substance deposited by oysters consists of microscopic crystalline plates, whereas man-made pearls are beads of glass (or plastic) coated in one or more layers of varnish. Some are even dipped in a mixture which includes ground-up fish scales to add some luminescence. 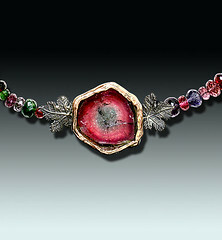 “Promise of Spring necklace,” by artist Eve J Alfille, features a collection of natural color pearls, cultured around the world; which Eve has combined to make up this beautiful necklace with her 18k white gold “Acanthus” series clasp. If you would like to learn more about pearls in general, you might like to become a member of The Pearl Society and receive the quarterly newsletter. Dues are $25 a year, and include bi-monthly meetings held in my Evanston, IL Gallery The Eve J. Alfillé Gallery & Studio (in the Chicago area). In fact, the very next meeting of The Pearl Society is Sunday, July 22, from 3 – 5 pm at Eve’s Gallery where the speakers will be discussing Natural Wisconsin pearls. Eve J. Alfillé will be taking her show on the road to the Peninsula School of Art in Fish Creek, WI; offering both a workshop and lecture on Collecting and Working with Pearls. Fish Creek is located in Wisconsin’s Door County area with plenty of accommodations and area attractions to make your trip an unforgettable one. Visit the Peninsula School of Art’s search by instructor page for complete class information, pricing, registration and travel information; or call 920-868-3455. Concept: Always an elegant element in jewelry, pearls are surprisingly easy to incorporate into your work. Learn a wide variety of approaches to designing with pearls from Eve Alfillé, founder of the international Pearl Society. Eve will present two pearl project designs using both metal wire and sheet, followed by an opportunity to work on your own designs with her assistance. Learn the most contemporary of techniques, such as caged pearls, in addition to creating a non-traditional clasp and the basic technique of drilling pearls. 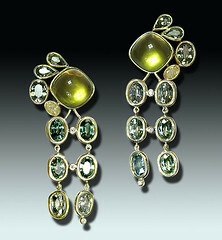 Eve will also contrast her applications to those of other exotic pearl designers. Experience: Eve begins the workshop with a presentation on the different types of pearls, their habitats, farming techniques, and economic facts as they affect jewelry designers. She will also bring advanced ideas for future projects. Eve will supply pearls for the workshop projects, with additional pearls available for purchase for later work. You should be confident with your fabrication skills to get the most benefit from this workshop. Concept: Join Eve Alfillé, the founder of the international Pearl Society and passionate collector, for an in-depth look at the world of pearls and pearl jewelry. 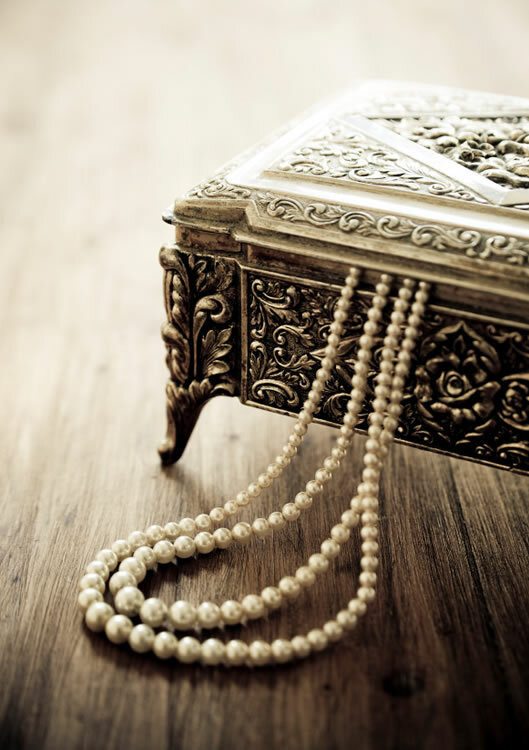 Learn of the pearl’s ancient history, their collection by flamboyant characters throughout time, as well as practical knowledge about determining pearl’s authenticity, their care, their worth, when to re-string, and redesigning contemporary jewelry from heirloom pieces. Examine and handle a sampling from Eve’s rare, varied collection gathered from throughout the world, including natural pearls, cultured pearls, faux pearls and simulated pearls. Explore past and present pearl fashions and learn how they are connected to pearl origins and occurrences. Discover new pearl colors, and other recent innovations in the industry brought forth from China and Viet Nam. Monday - Saturday 11 a.m. to 6 p.m.
Extended hours Thursday until 8 p.m.
Let's toast to three decades of the Eve Alfille Gallery & Studio by celebrating with a new series of fine art jewelry!